Michael J. McCool, Sr., 75, passed away early Monday morning, August 22nd, at his home in Seattle, Washington. He was born January 14th, 1941 in Seattle to Helen and Harry McCool. Mike grew up the second of four children in Seattle's Eastlake neighborhood, attending school at St. Patrick's school. His siblings were older sister Stephanie and younger brothers Peter and Harry. 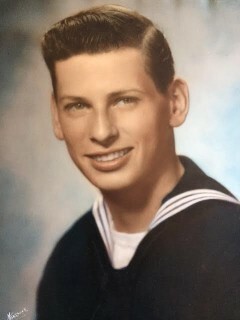 He enlisted in the United States Navy at the age of eighteen, was a plankowner of the destroyer USS Richard S. Edwards, and served as a gunner's mate for three years, eight months, and eight days. He was honorably discharged in 1961. Mike married Margaret (Peggy) D. Bullwinkel August 31, 1963 in St. Joseph's church in Seattle. They met when they were both fifteen years old at a party of a mutual friend, and were married for nearly fifty-five years. Mike and Peggy welcomed their first child and daughter Linda Marie into the world June 23rd, 1964. She was followed by brothers Michael John (Jr.), on March 9th, 1966 and William Harry on January 16th, 1968. Mike worked a variety of jobs in the Seattle and Alaska fishing and maritime industries before he and Peggy founded their own company Marine Works Inc. in 1977. Based in the heart of the Ballard business community and in Dutch Harbor, AK, their company was a highly respected provider of mechanical services to the Bering Sea fishing fleet as well as other segments of the Pacific Northwest workboat industry for over twenty years. Mike and Peggy both retired in 2001. Mike is survived by his loving wife Peggy and their daughter Linda McCool (Keith Johnson) of Kodiak, AK, son Mike McCool Jr. (Lucy Hsu) of Yangon, Myanmar, and William McCool (Lisa) of Bothell, WA, sister Stephanie (San Rafael, CA), brother Peter (Lydia) of Snohomish, WA, and grandchildren Hannah Johnson (Zeb Kraft) of Anchorage, AK, Eli Johnson of Kodiak, AK, Erin McCool of Yangon, Myanmar, Jacob McCool of Bothell, WA, and Conor McCool of Bothell, WA. He was also a beloved uncle to numerous nieces and nephews. Mike was preceded in death by his brother Harry in 2015. Mike leaves behind many close and long time friends. In addition, for fifteen years, Mike befriended numerous neighborhood dog owners and their pets through the "dog bone tree" in front of his house. At Mike and Peggy's request, no funeral services will be held. Sorry for your loss Peg. Love you all. Nick and I are so sorry for your loss. Please know our prayers and thoughts are with your I tire family. Peggy, so sorry to read of Mike's passing. Please know you are in are thoughts. Peggy, my sympathies for your loss. Many memories of Mike from grade school. Take care. Peggy, I am so sorry about Mick's death. I remember when you met him but not sure at whose house ? Sounds like you had a very good business. Congrats. I hope that he did not have to suffer. Maureen O'Brien remembers him from St.Pat's and said he was a real nice person. Dear Peggy and Family, Christ's very special peace be yours as a sharing in your dear husband's Eternal Peace! Please be assured of a continued remembrance in our thoughts and daily prayers. What a beautiful and meaningful obituary to honor him! May God's infinite and merciful love bring you strength and comfort at this time. All of the Holy Names Academy community is praying for you and your family! Peggy and family. Stephanie and Pete, Sad to hear the news you are in my thoughts and prayers. from the Eastlake neighborhood,and St Patrick-school.